Chinese-made missiles have downed at least two Syrian army helicopters during the country's ongoing conflict, defense observers told the Global Times Wednesday, noting such publicity will raise the image of Chinese defense products on the international arms trade market. Two videos uploaded online by Free Syrian Army rebel forces show two Mi-8/17 helicopters downed by shoulder-launched, air-defense missiles, or Man-Portable Air-Defense (MANPAD) systems. The first video was shot in the eastern city of Dei ez-Zor, while the second video was shot on March 6 at Menagh Air Base near the northwestern city of Aleppo. The confirmed sightings of surface-to-air FN-6 missiles developed by China Aerospace Science and Technology Corporation sparked a wave of online interest among Chinese military enthusiasts and observers. It's still unclear how the missiles found their way into the hands of the rebels. "Any bloodshed is regrettable. I am sorry for those who lost their lives during the conflict. In regards to export prospects, Chinese weapons need to engage in more conflicts to prove their value," Daniel Tong, founder of the Chinese Military Aviation website, told the Global Times, adding that exported Chinese weapons have limited real combat experience compared to US and Russian products. Last week's video, which shows a missile flying through clouds before striking a barely visible helicopter, demonstrates the FN-6's capability to hit targets flying close to its combat ceiling in complicated weather conditions, Tong said. "The kills are proof that the FN-6 is reliable and user-friendly, because rebel fighters are generally not well-trained in operating missile systems," he said. 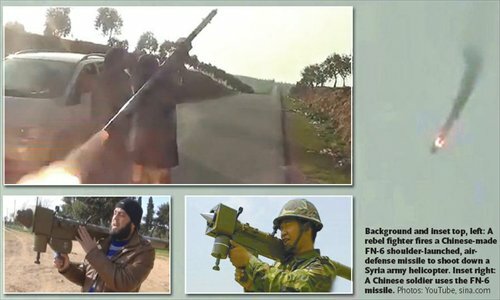 Exported Chinese MANPAD systems have downed targets in several conflicts worldwide, but Syria's civil war marks the first time they have been captured on camera in combat. Tong noted such publicity will boost the profile of China's air defense products as a whole. China has sold MANPAD and short-range air defense missile systems to a number of countries. But its advanced middle- and long-range air defense missile systems, such as the export versions of HQ-16 and HQ-9, are still struggling to win foreign orders and international recognition.